Shirley Pettis, a successful California businesswoman and congressional spouse, won election to the U.S. House of Representatives to succeed her husband, who died in 1975. During two terms in Congress, Pettis sought to continue Jerry L. Pettis's conservative legislative agenda and sponsored an environmental bill that vastly expanded the "wilderness" boundaries of the Joshua Tree National Monument east of Los Angeles. Immediately after the accident, friends and associates began encouraging Shirley Pettis to run for her husband's vacant congressional seat, which included vast tracts of desert and mountain areas east of Los Angeles in San Bernardino and Riverside counties. "‘Shirley, you have to run,'" she recalled them saying to her. "‘You have name recognition and everybody knows you.'" But it was not until her daughter, then 16 years old, and her 19–year–old son encouraged her that Pettis filed for candidacy.4 Campaigning as her late husband's "working partner," Pettis won more than 60 percent of the vote against a field of 12 other candidates in the April 29, 1975, special election to fill his seat. "I think the people definitely felt that Jerry Pettis' philosophy and mind—that government should serve the people and not that people should serve the government—was the philosophy they wanted to continue to represent them," she said the night of her victory.5 After taking the oath of office on May 6, 1975, she was appointed to the Committee on Interior and Insular Affairs. In 1976, district voters elected Pettis to a full term in the 95th Congress (1977–1979); she defeated Democrat Douglas C. Nilson, Jr., with 71 percent of the vote.6 In January 1977, Pettis was assigned to the Committee on Education and Labor and the Committee on International Relations. On nonenvironmental issues during her two terms, she voted with her GOP colleagues to oppose federal funding for abortions and the creation of a federal consumer rights agency, and she proposed cuts to America's military and economic assistance to South Korea.8 As a Representative with 16 Native–American tribes in her district, Pettis remained a consistent advocate of legislation aimed at improving the health and welfare of Native Americans. 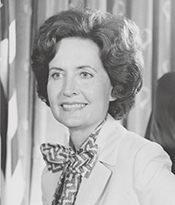 Citing difficulty with keeping in touch with her constituents from the sprawling 27,000–square–mile California district, Pettis declined to run for renomination in 1978.10 From 1980 to 1981, she served as vice president of the Women's Research and Education Institute in Washington, D.C. Following that, Pettis was a member of the Arms Control and Disarmament Commission for two years. President George H.W. Bush appointed her to the Commission on Presidential Scholars, where she served from 1990 to 1992. In 1979, Pettis also began a long term of service on the board of directors of a major insurance company. She married Ben Roberson in February 1988. At the age of 92, Shirley Pettis died on December 30, 2016, in Rancho Mirage, California. 1Information about her first marriage appeared in a Loma Linda University newsletter, http://www.llu.edu/news/today/june0602/ grad.html (accessed 26 May 2004). 2Gary Libman, "Audiocassette Tapes Have a Way With Words," 28 December 1987, Los Angeles Times: 1("View" section); Information about the Audio Digest Foundation appeared in a Meetingnet.com article, Tamar Hosansky, "An Ear for CME," 1 January 2002, http://mm.meetingsnet.com/ar/meetings_ear_cme/ (accessed 18 March 2005). 3"Rep. Pettis Dies in Crash of His Plane," 15 February 1975, Washington Post: A4. 4Interview, Women in Public Service, video (Washington, D.C.: U.S. Capitol Historical Society, 1998); "Widow Is Running in California to Fill Seat Husband Held," 28 April 1975, New York Times: 21. 5"Mrs. Pettis Elected to House Vacancy," 1 May 1975, Washington Post: A2; see also, Michael J. Dubin et al., United States Congressional Elections, 1788–1997 (Jefferson, NC: McFarland & Company, Publishers, Inc., 1998): 694. 6"Election Statistics, 1920 to Present," http://clerk.house.gov/member_info/electionInfo/index.aspx. 7"Country's First Solar Power Plant Planned for California Area," 20 August 1977, Washington Post: D3; "Around the Nation," 12 August 1977, New York Times: 8. 8Karen Foerstel, Biographical Dictionary of Congressional Women (Westport, CT: Greenwood Press, 1999): 218. 9Women in Public Service, video. 10"The Capitol," 28 January 1978, Washington Post: A3. Papers: In the Jerry and Shirley Pettis Papers, 1966-1978, approximately 150 cubic feet. The papers of Shirley Pettis contain personal, business, and congressional papers and correspondence, including photographs, portraits, motion picture film, sound recordings, and memorabilia. A finding aid is available in the repository. Papers: In the Candidates for Public Office Campaign Materials, 1966-1976, 0.5 linear foot. Subjects include Shirley N. Pettis. "Shirley N. Pettis" in Women in Congress, 1917-2006. Prepared under the direction of the Committee on House Administration by the Office of History & Preservation, U.S. House of Representatives. Washington: Government Printing Office, 2006.